New year, new skincare? Cleansing should be the first part of everyone’s skin routine. We should all know this essential step, but did you ever think -is it enough? Somewhere between getting caught up with ‘Shake and Shot’ masks, we forget the importance of cleansing our faces. 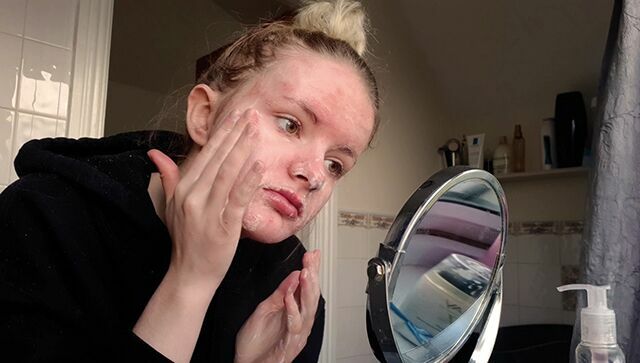 There is absolutely no point in lavishing your face with some expensive luxurious moisturiser you just bought to treat yo’self, unless your skin is clear of the dirt so that it can soak it effectively. You will be surprised what’s left on your face if you only cleanse once, try it – It can be frightening. First of all, let’s point out a misconception, micellar water is useful to take off stubborn makeup as an initial first cleanse yes, however it is just as bad as a face wipe which causes your skin to dry out or even breakout. According to ‘The Skin Nerd’ companies try to sell their micellar water as beneficial however they “bulk up their micellar water with drying alcohols, fragrances and harsh preservatives for the purpose of prolonging shelf-life”. Throughout the day our skin is exposed to pollution and airborne bacteria so double cleansing is essential to scrub all that grime away. According to Dermologica.ie, double cleansing is cleansing the skin twice, first with an oil-based cleanser, then with a water-or surfactant-based cleanser. The first cleanse is designed to remove makeup/dirt but the second cleanse is where you treat or medicate your skin. It is so important to use the first oil-based cleanser to take off all the surface makeup and using cotton pads to remove it rubbing carefully. It’s best when you can no longer see visible makeup on the cotton pads. Straight after it’s important to move onto your second cleanser which should have some sort of active ingredients to treat whatever it is your skin needs whether it be dehydration, dullness or breakouts. In order to get the benefits of the cleanser, it is recommended that you massage the water-based cleanser for at least one minute into the skin to ensure makeup removal. If you want to go the extra mile you can use a warm face towel to remove the dirt. If you want to save some money, you could choose an alternate pre-cleanse which is a microfibre mitt. ‘The Skin Nerd’ provides the perfect solution with her microfibre cleanse off mitt which is only €5.95 and is machine washable. It is suitable for all skin types and even removes waterproof mascara (tried and tested). If you use this mitt or something similar it should remove the surface makeup saving you money because you then only need one particular cleanser to treat your skin for your second cleanse. Finally, please do not over-irritate your skin. Double-cleansing does not mean strip your face of all its natural oils. If your skin feels tight after this, it means its dehydrated and you have over-washed your face. It’s important to be aware of your skin natural oils and how essential it is to not over-scrub or over-exfoliate your skin. Don’t be afraid if your skin is a small bit oily it’s natural- use the correct cleanser for your skin type and your skin will remain balanced, hydrated and bright.